There’s a new Supported Hardware page on dragonflybsd.org. I think the idea is not to be comprehensive, since that’s a nigh-impossible task. Instead, it’s to note the combinations of hardware that work really well. Sepherosa Ziehau has made some changes to default SCI settings in ACPI. This may make it possible to boot a computer, or to boot a computer with ACPI, that did not boot before. If it causes problems, he lists some various tunables to set. Just don’t ask me what SCI does. Hey, it rhymes! Matthew Dillon’s added support for 4-port Gigabit Ethernet PCI-E cards from Intel. I wish I had one. No, 2.10 is not out. I built packages for pkgsrc-2011Q1 on 2.9, and set it to think 2.10 so that the pkgsrc tools wouldn’t complain. We’re close enough to release that this shouldn’t be a problem. The packages are available for x86_64; i386 packages coming “soon”. See my note to users@dragonflybsd.org for details on accessing these packages. 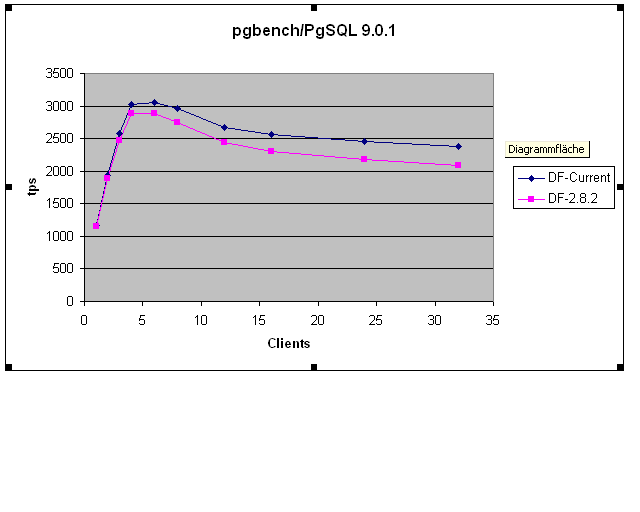 The first one is a comparison of pgbench running on the same hardware twice – once with the 2.8 release of DragonFly, and once with a recent 2.9 version. 2.9 is definitely looking to be faster than 2.8. These results are astonishing. Please, someone compare with other operating systems! I mentioned this before, but there’s now an official announcement that pkgsrc is (now, after the 2011Q1 release) going to DESTDIR support and what that means. Get out your wallet! I encourage purchasing here. You should buy a SSD. Not necessarily news to you, but that article does a good job of summarizing why. Introduction to Architecting Systems for Scale – you either don’t care, or find scaling questions immediately engaging. I am one of the latter, so here’s the link. I’ve been watching pkgsrc-changes@netbsd.org for a little while. One thing I’ve discovered: there’s a lot of updates going on! Another thing that’s nice to see: DragonFlyupdates, including ones that help with our move to gcc 4.4. Aw, no more Kermit. (via) Not that I have a use for it at this point, but still: aww. I bet in about 10 years I’ll say the same thing about… gopher? Remember that? It’s not even supported in Firefox 4 now, which kinda makes me feel sad. And old. 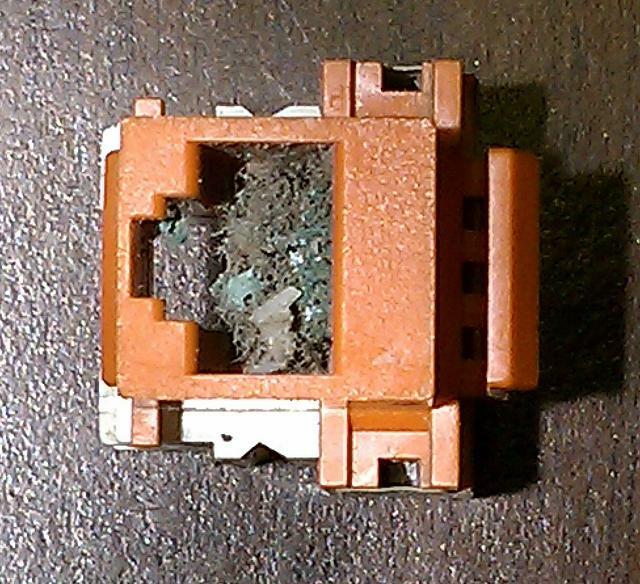 That is what happens to an exposed RJ45 port after a few years in a salt mine (my employer). This was inside an enclosed, mostly-sealed structure, too. Peter Avalos squeezed in one more thing before the DragonFly2.10 branch: an update of OpenSSH to version 5.8-p1. This is mostly a security fix upgrade to 5.7 – see the OpenSSH release notes for details. There’s been plenty of discussion about Summer of Code projects on the mailing lists. One conversation about “Implementing a mirror target for the device mapper” led to a longer description from Venkatesh Srinivas about mirroring and how he’s looked at implementation. Branch tomorrow, release in 2 weeks. There’s a ton of new features for 2.10, so this will be a fun release. I’m trying to get pkgsrc-2011Q1 packages built for 2.10 ahead of time, too. Welcome John Marino, who has been working on some rather difficult updates for gcc and other toolchain items. The Open Source Business Resource issue for April is out, themed on Collectives. A lot of it covers the Keystone Off the Shelf (KOTS) project, which is a collection of open source software designed to work as a starting package for a technology business. Read the first article for more details. 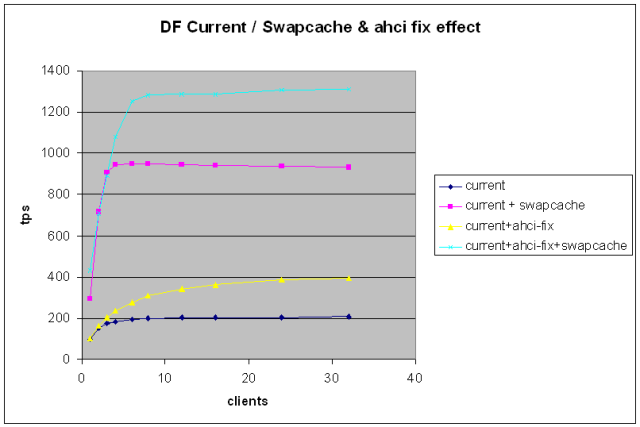 Matthew Dillon made some changes to swapcache(8). 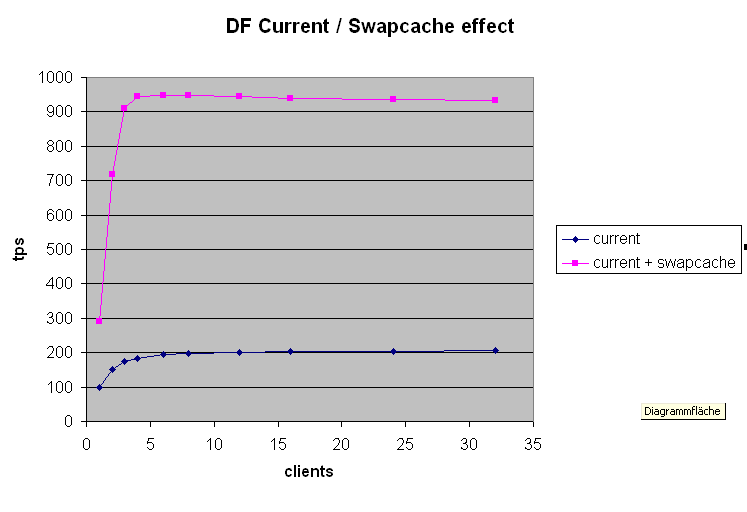 Swapcache is now able to cache a lot more data, and the result is that general disk performance for _all_ disks is accelerated by an included SSD using swapcache. Performance previously restricted to all-SSD systems or serious RAID setups is now possible with much less investment. In addition to that, the long-term wear on the SSD appears to be less of a problem than expected. If you’d like to read some of the Summer of Code student proposals for DragonFly, there’s a number of them available. I haven’t found a way to get a comprehensive list without being logged in, yet. We’re aiming to make this the last branch to support non-DESTDIR packages. We have almost finished the transition to DESTDIR installation, where a staging directory is used to make a binary package, which is then managed by the pkg_install tools. The reason I’m highlighting this is: it’s good news! One of the long-term complaints with pkgsrc is that the upgrade process is painful. If you try to build an upgrade and the build processfails after uninstalling the existing package, not only are you not getting the upgrade, but you’ve lost the existing package. Binary packages for download helps with this (and generally is faster), but only so many packages can be built separately and made available for download. Building a package separately and then installing from there removes these issues. No binary redistribution issues, actual downtime is minimal, and the package is known to work when an upgrade happens. This removes most of the problems I’ve heard raised about pkgsrc over the years. Sascha Wildner has moved gcc in DragonFly to a slightly newer version: 4.4.5. It mostly seems to make things easier to compile, going by the reports I’ve heard. This is the version that will be in DragonFly 2.10. The April issue of BSD Magazine is out! It’s a very full issue, including another news roundup by yours truly.